The Gray Iron Fitness Newsletter, Issue #023 Hiking for cardio. In today's August 15, 2009 newsletter . 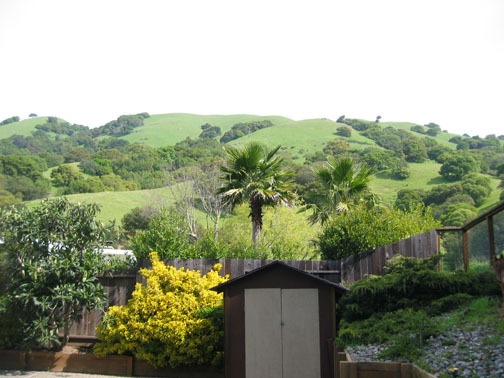 . .
Our home backs up against open space and The Hill. What you see from the yard is not the top. There is another hill just behind it. It is a steep 1,200 ft. climb to its ridge. There are several narrow trails up, and most are without horizontal zigzags (switchbacks) to make the route easier. The Hill is part of a preserve. We share the land with deer, coyotes, raccoons, wild turkeys, and, occasionally, mountain lions. No hunting or motorized vehicles are allowed. You walk or ride a horse. Years ago, I would go to the top twice a week or more. It usually took about 20 minutes if I used the trail closest to our house. Nowadays, I don’t go to the top as often. Most of the time, I hike along a lower trail that runs parallel to the ridge, rather than going straight up. When I’m weight training at the gym, I wonder about all the people on stationary bikes and treadmills. I admire that they are getting cardiovascular exercise. But how tedious it seems when so much of nature's beauty awaits outside. I do not run much anymore. At one time, long distance running was part of my routine. I was never a top-notch runner but did complete some tough courses, such as the famous Double Dipsea event. Now, hill hiking is my preference. Recently, I watched one of our daughters, Danielle, complete a half-marathon race. She has been training as a runner for only one year. It has been good for her physically and emotionally. She looks and feels great. It suits her and she is enthusiastic about continuing. We are proud of her. Yet I do not think long distance running is the smartest way to exercise as we grow older. It may annoy some runner friends when I say it. 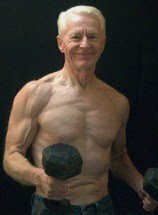 But too many senior long distance runners look older, to me, than their years. I have my gray hair and wrinkles, but I'm not bent and hobbled with achy joints from years of repetitive pounding. If they must run, shorter more intense intervals combined with walking may be a better choice. Swimming and cycling are also fine cardiovascular options that do not pound your joints into submission. However, if you are a senior and enjoy long distance running, and you are not having backaches or knee problems, pay no attention to me. Do your thing. I will continue my weight training, and that’s probably me you see walking up The Hill. 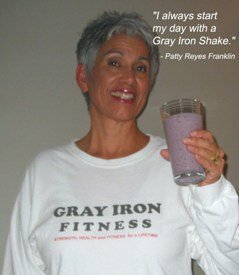 I write about starting the day with the Gray Iron Super Shake about once every quarter. And every time I do, someone takes the time to write and say they tried it and how much they enjoy it. We have experimented using various fruits but prefer the mixed berries flavor, and berries are hard to beat when it comes to anti-oxidants. We have, however, added another ingredient, which I'll explain at end of the item. Put into a blender. . .
3-tablespoons of freshly ground flaxseeds (you need a coffee grinder). 2-heaping tablespoons of nonfat yogurt containing live friendly bacteria (and without sweeteners). 2-scoops of plain whey protein powder (40 grams of protein). 2-cups of fresh or frozen mixed berries (with no added sweeteners). 2-cups of plain soy milk (with no added sweeteners). I've also mentioned that two or three hours later, we’ll have a bowl of oatmeal with nonfat, low-fat, or soy milk. We add sliced banana, or other fresh fruit, a few raisins, and a little cinnamon for flavor. Sometimes, for added protein, we include a ¼ to ½ scoop of whey protein. After reading this, someone wrote to ask why it’s important to have the super shake first, and then, later, the oatmeal. Well, the order isn’t important at all. We just happen to prefer it that way. If it's more convenient for you to reverse the order, that will work out fine. Either way, you are going to be supercharged all morning. Craig Ballantyne likes shakes and smoothies, too. He wrote that he experimented by adding spinach or kale to his drinks, desiring additional vegetables in his diet. He claimed the fruit in the smoothies dominates the flavor to such a degree that he couldn’t even detect, say, spinach flavor at all. I was a doubter, but tried it, and he is right. The shake tastes just as delicious, and now it has even more nutrients than before. So I usually toss in several uncooked spinach leaves.